Freshman quarterback Caylin Newton, Cam’s younger brother, is already making a name for himself. In his first college game, Newton led Howard University to a 43-40 upset win over UNLV on Saturday night in Las Vegas. Newton ran for 190 yards and two touchdowns and passed for 140 yards and another TD against the Rebels. Newton, at 5-foot-11, 195 pounds, is the younger brother of Carolina Panthers quarterback Cam Newton and former NFL center Cecil Newton Jr. He threw for 3,322 yards and 33 touchdowns and ran for 1,000-plus yards and 13 TDs during his senior year at Grady High School in Atlanta. 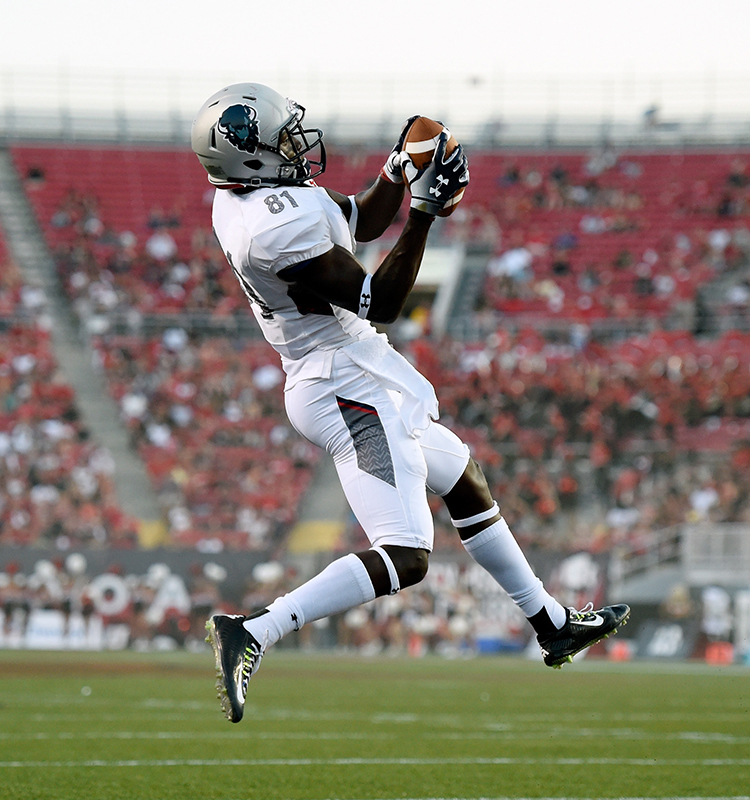 Wide receiver Kyle Anthony of the Howard Bison makes a touchdown reception against the UNLV Rebels during their game at Sam Boyd Stadium on Sept. 2 in Las Vegas. Howard’s upset of UNLV is considered one of the biggest ever in college football, and it is, for sure, Howard’s most notable. Saturday’s win was the second Football Championship Subdivision (FCS) upset over a Football Bowl Subdivision (FBS) team by a historically black college or university already this season. Tennessee State beat Georgia State 17-10 on Aug. 31. It was Howard’s first win in a season opener in more than a decade. Howard will face another FBS opponent this week at Kent State. Other notable HBCU upsets last weekend: Albany State over Valdosta State and Virginia State over Norfolk State. Of the matchups between HBCUs and FBS teams this week, Alcorn State has the best FPI chance to win (14.1% at FIU) of any. Howard has a 4.1% chance of pulling off the upset for the second straight week. Running back Anthony Philyaw of the Howard Bison dives for the end zone against the UNLV Rebels during their game at Sam Boyd Stadium on Sept. 2 in Las Vegas. 2016 South Alabama 2.3% Mississippi St.
2013 Eastern Washington 2.4% Oregon St.
2015 Portland St. 2.4% Washington St.
Bethune-Cookman running back Anthony Jordan leaps as he runs during the first half of an NCAA college football game against Florida International on Sept. 14, 2013, in Miami. 2017: Tennessee State beats Georgia State 17-10 for the first FCS over FBS upset of the 2017 season. 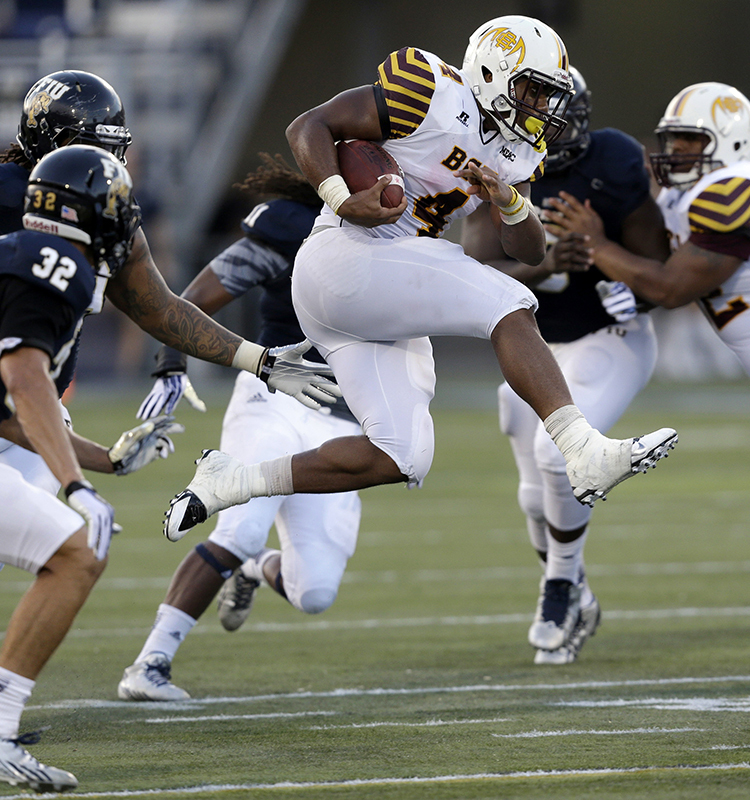 2013 and ’14: Bethune-Cookman beats FBS team Florida International in back-to-back seasons. 1985: Grambling State defeats Oregon State 23-6 under coach Eddie Robinson, who ties Alabama’s Bear Bryant with his 323rd victory. 1979: Florida A&M upsets Miami 16-13 after Miami misses game-tying field goal in the final seconds. Kyle O’Quinn (No. 10) and Brandon Wheeless of the Norfolk State Spartans celebrate after winning 86-84 against the Missouri Tigers during the second round of the 2012 NCAA Men’s Basketball Tournament. 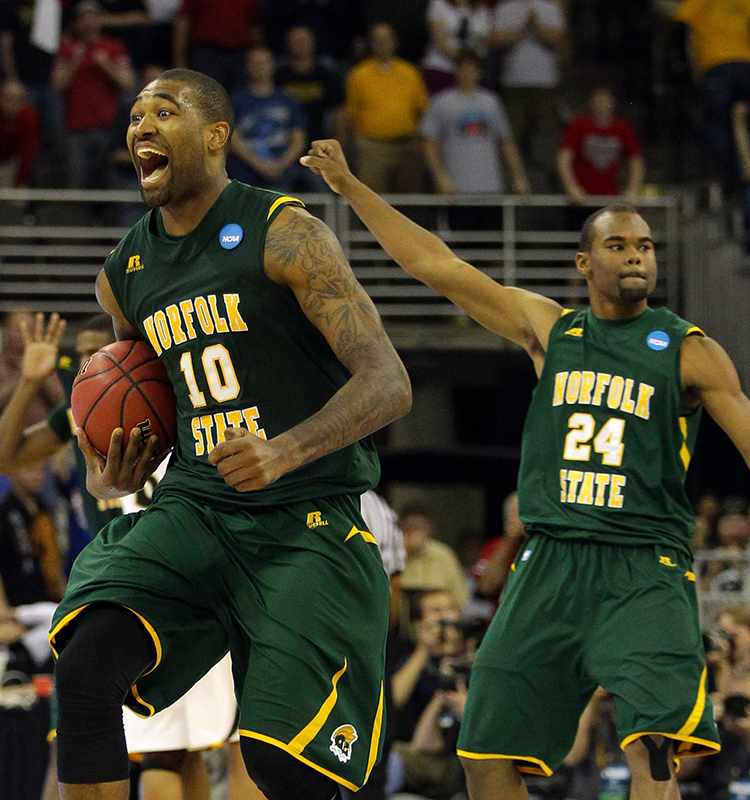 2012: 15-seed Norfolk State upsets No. 2 seed Missouri 86-84 in first round of NCAA Tournament despite being 21.5-point underdogs. 2001: Hampton stuns 15.5-point favorite Iowa State 58-57 in first round of NCAA Tournament. 1997: 18.5-point underdog Coppin State shocks 2-seed South Carolina 78-65 in first round of NCAA Tournament. 1993: Southern University defeats Georgia Tech 93-78 in first round of NCAA tournament. 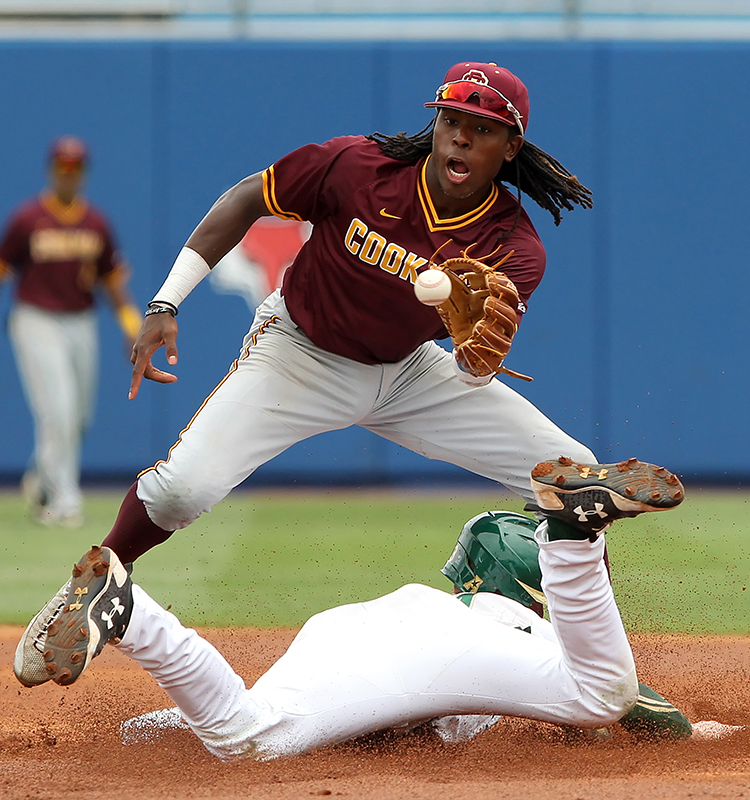 Demetrius Sims of Bethune-Cookman waits for the ball as Duke Stunkel of South Florida slides into second base safely during their college baseball Gainesville Regional game June 2 at Alfred A. McKethan Stadium in Gainesville, Florida. 2017: Bethune-Cookman advances to first regional final in program history and defeats third-ranked, and eventual national champion, Florida before ultimately losing the series. The North Carolina A&T 4×100 team places third in the 2017 Track and Field Championships. ESPN Stats & Info contributed to this report. ESPN Football Power Index – 2017 The Football Power Index (FPI) is a measure of team strength that is meant to be the best predictor of a team’s performance going forward for the rest of the season. FPI represents how many points above or below average a team is. Projected results are based on 10,000 simulations of the rest of the season using FPI, results to date, and the remaining schedule. Ratings and projections update daily.